According to legend, there was once seven mermaids, one for each sea. They each guarded a sacred treasure that they had to protect. When these treasures were brought together, they became an item powerful enough that whoever wielded it would gain power over all the seven seas. Hearing of this legend, seven notorious pirates went on a long journey to search for the lost treasures. When they were unsuccessful, they passed the task onto the next in line to be captain. And so it went for many years. Now, all seven treasure have been found, but there's a few problems. Each captain only has one treasure, and in order to gain the sacred item that rules the seas, all seven treasures must be brought together. Plus, the government also has their eyes on the treasure, and also wish to arrest the pirates. So with the army on your feet, and six more items to steal, which pirate will reign victorious? So here's the dealio, you can either be a pirate or a soldier. Each pirate ship should have at least five members on the ship. There will be seven Captains--one for each of the seven seas. The main geners of this are action, adventure, and fantasy. I will allow romance, but give it some time, and check with the person first before you start up a relationship with someone. Also, if you want to start out with one character being in love with or having a close relationship with another character, that's fine too. But remember, ask the person first. Also, please keep it PG. Anyone came be captain. It's first come, first serve. Here comes the fun part. RULES! "What's up?" my friend responded. "Eh, not much." I shrugged. "Cooleo." I said doing a hair flip. 4. anything that was mentioned in the CREATIVE ROLEPLAY rules applies here. 6. Try to make good qualitiy posts. 7. Anyone not following the rules will be banned from this rp. 8. If you haven't posted in a while, go back and read the other posts so we're all on the same page. It's fustrating, I know, but it will cause less confusion. 9. Try and post at least 1 or two times a week, that way you can avoide Herr Problem above. 10. pay attention to what other people say in their post, we don't need one person going, "Hey, let's go to Walmart to buy strawberries." and then another person suggesting something similar or just ignoring them completely. Respond to your fellow RPers. Arevhad (ah rev HAD)- Major Farming Country. Mostly rural with a few towns here and there. Mangeni (man GEH nee)- Major fishing Country. They are more involved in trade. More suburban. Jessamine (JESS ah min)- Major mining counrty. Nesrin (nehs REEN)- A peaceful, beautiful country. Ju-long (joo-long)- Major manufacturing country. Also has many coal mines. Zhuo (choo o)- Major trading country out by the sea. Bibhas (pronounciation unavailable)- A poor farming country. Mostly fileld with slums. Charu (CHAH ru)-A country near the ocean. Mostly into the smithery buisness. Reta (RAY tah)- A major Sea Port country. Mostly saburban. Toomas (TO mas)- Farming Country. Kalini (kah LEE nee)- Famous for their culture and food. Mix of Rural and saburban. Soren (SOR en)- A country by the sea. Poorer then Kalini but still a major tourist industry. These are the major continets and countries of the role play. To make things simple, each continet only has a few countries within them. The royal country where the monarchy or government is located. This is usually a smaller country. And two other countries that hold all the residents. These countries are wider and vaster. The countries are listed underneath the continets. The rest is just wide open sea and small islands. Blue Morgan--A dissendent of one of the mermaids. She has the power to track down magical items. Currently in Atlantanian Government's custody. Captain Robert "Johnson" Johnson--Former Captain of The Atlantic. He went missing while on one of his adventures and his whereabouts have been unknown since. He'll become very important later. Do NOT overuse these. I'm allowing NPC's because they could be necessary from time to time. If you overuse them, I will give you a warning. If you continue doing it, you get the boot. So if you want to be a pirate, here's how you should set up your character profile. Also, here are the treasures for each of the oceans. Each item has an ability that only the captain is able to accesses. If the item is not present, the captain cannot perform the ability. Here is the template for the Soldiers. You don't have to be a pirate or a soldier. You can be a civilian if you so choose. Pros: Mai is courageous, witty, and a good leader. She is very mature for her age. She takes her role as captain very seriously and does her best to take care of her crewmates. Mai is a pacifist, but will fight if she is forced to. Although she wishes to find the six pieces of treasure, finding Johnson is her main goal. Cons: Even though she has a great sense of reasonability, Mai can still act immature at times. She is very stubborn and isn't very open to new suggestions. Mai is easily sidetracked. She can get so caught up in her goals that she will forget the needs and safety of others. She is also very blunt and frank with people. Though most of the time she has a cool head, Mai is sensitive about her age and height and often goes into rages of fury when she is teased about it. She also tends to be reckless and will put her life on the line to protect something she cares about, be it her crew, ship, treasure, or goals. History: Once a dainty young noble, Mai grew up in Reta. Due to being blind, Mai was always told she was too weak to do things on her own, but she was still stubborn enough to keep trying anyway. When she was twelve, Mai had the pleasure of being kidnapped by a nutritious and hansom young Atlantic pirate named Johnson, who planned to hold the girl for ransom. However, Mai insisted that she go with him and after much whining, he reluctantly agreed. Johnson taught her everything he knew about the sea, fighting, and pirating. After Johnson disappeared, Mai took over as the ship's captain. She is determined to fulfill Johnson's dream and obtain all six of the other treasures while searching for her long lost friend. Because she is blind, Mai always carries a long wooden staff with her. However, this is merely her tool for combat. Mai is able to see using vibrations and sound. Her item is the Jade Sea Comb, which allows her to hypotize people with her voice. Whoever is unlucky enough to hear her voice must do her bidding. to use the comb, so must place it in her hair. Pros: Rita is fairly smart. She climbs buildings, very sneaky, and knows how to get her way. She can get away from people easily since she’s a fast runner. Cons: She’s usually stubborn and determines to help her family and her siblings. She can’t trust people easily. She’s headstrong most of the times but she’s caring towards her family. Trade: She doesn’t have a job. Although, she helps owners of shops around her town and they usually pay her for doing well. She gives the money to her family so they could buy food. Or she justs steals food. History: Rita was born in a low-class family with a lot of other three siblings. She used to have a big brother who was the main person to get food for them, but he disappeared one day, out of the blue. He was a role-model towards Rita and dreams of seeing him again in the near future. If possible. She isn’t afraid of pirates, she actually thinks they’re cool. Although her parents are terrified of them. She dreams of becoming one someday. But her family is in trouble so she can’t leave them alone. 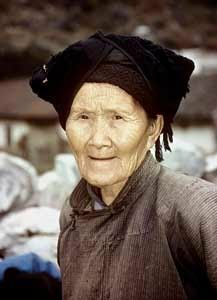 Lei D. Fang, a seemingly ancient woman, is a wise, yet strange woman. Being a master in the art of fan battle arts, she carries a few small ones with her, each packing deadly blades around the larger part of the fan. Around the part that causes those fans to fold, she has dagger-like blades for a sneak attacks. Wearing a long, silk, green, flowing robe, that has little white clouds and golden trim, the fans hide nicely in her sleeves. Her hair is looped up in a traditional warrior woman costume. As stated before, she's an extremely dainty woman. But this strict woman does not lack ferocity. Possessing much more speed than strength, one would think of this old woman as something like a mongoose. Her small frame does not yield her wisdom though. She speaks it to everyone, constantly flaunting her opponents with it. Lei Fang is an expert strategist. Lei Fang is more of a quiet woman, depending heavily on more stronger, loyal recruits to keep the others in line. She can still fight, but with old fashioned boxing, she will be beaten quick. Unable to assert her dominance easily may keep her shadowed, but it doesn't stop her from at least trying. This woman is more of a headstrong pirate, leading her crew into many battles, with nearly impossible strategies for those who are inexperienced. Lei Fang was born to a Kung Fu Master and teacher. Brought up from an early age, her mother kept her from associating with her father's kung fu business. This disappointed Lei Fang, as she wanted to learn how to fight. So instead, she secretly began to train under a Kung Fu Mistress, who taught her two stances, the Crane stance, and the Dragon stance. Training under her, Lei learned how to fight, and kept under her secret lessons for a while. One day, her parents found out. And her father, while slightly proud, disciplined his daughter, while her mother threw a fit. That night, Lei Fang ran away, and hid with her master. Years passed, the girl devoted to the arts. It was then that she was introduced with fans, and began to create her own style and stance, called the Mongoose stance, which enabled her to move quickly with little effort. Eventually, she was awarded with her black belt, and left. Lei then became a pirate through a series of events. Walking onto their ship as a prisoner, the wise woman, who was now 26, awaited her sentence. When they released her, she whipped out her fans, and defeated a large number in a matter of minutes. Smirking, she confronted the Captain, executing him on the spot with a quick slice of her fan. This was when she took over the position as captain, and remains there today, looking through a Porcelain Pot, using her clairvoyance abilities. Appearance: Some of her distinct features are her curly bright orange hair, bright red lipstick, and big brown eyes. She also carries her trusty military baton that can cause some serious pain. It is always by her side. Upbeat, Spunky, Determined, Protective, Leadership; she is a happy carefree woman who likes to have fun. She usually has a laid back personality and is not afraid to chide or swing around her baton (playfully) to anyone who disobeys her. When she has a goal in mind, she will do anything to achieve it. To her, her crew is like a family and will do everything she can to protect them from harm. At first she may not be much, but once her crew is in danger, her leadership skills are at its peak. Persistent, Narcissistic, Childish, and Merciless; when she grabs a hold on something, she will not let go, she will continue to be persistent which leads to dire consequences and unwanted attention. She can be childish at wrong times and will get pouty when she doesn’t have it her way. Kathereen is a narcissist, who thinks is beautiful and the most perfect person in the world whenever she looks into a mirror. (Of course she is not.) When it comes to pirates she can be quite merciless and harm even pirates who are still children. History: Living in the most peaceful and beautiful country of Nesrin, they didn't have to worry about the ash filled skies of Jessamine. Her mother died while she was young but both her mother and father were officers in the Navy. Since he wasn’t home much she had to stay with the neighbors, but Kathereen still loved her father very much. Whenever he came back home, he would tell her the most amazing stories and bring back little souvenirs from the many Isles he visited. She looked up to him a lot, but she didn’t want to become a Navy Officer. When she grew up she wanted to become a teacher perhaps, or maybe the most famous merchant alive! Kathereen was still young and had a whole life ahead of her. She was still a mere child at the age of 12 when she learned her father died while in battle. His body was cremated and placed in a grave where all the navy officers were held. The only momentum of him was his military baton. He lost his life an honorable death, but she couldn’t accept it. Her hatred towards pirates deepened and swore she would kill every pirate alive. Kathereen joined the navy and moved her way up the ranks to become a captain of the ship called, The Free Mason. A ship her father was on before. Your rank in the military. Pardon, but is that Lady Gaga? .....Katey Perry, perhaps? x3 Found this on devi art one day;; I believe the model is Despina Tsilimigaki. Its based off a old movie called Alice in the Navy xD. niceness. I still await sign ups :-D BTW, i'm not keen on military and navy ranks. I tried looking some up, but i'm not 100% sure of what they do or their position. ^^' Plus, there are many different ranks from many different countries en such. Personality: A careing heart towards the young, a bit clumsy, a dirnker although shouldnt be allowed, daring, and an unforgiving heart to those who double cross her. History: Aileen grew up a simple daughter to a rather famous chef. When she turned 15 her and her parents went out on a cruse to celibrate. That is when pirates attacked her and killed hr parents. They kidnapped Aileen and raised ehr fro one short year. After she turned sixteen she escaped the ship and sunk it with its men. She had set explosives down in the bottom of the ship and just befor she went to the main deck she fluung a lit match down there. She jumped off just befor it could get her. Ever since she has been sailing the seas on a ship that she bought after stealing the treasure rom the ship she sunk. Her item is the red ruby earings. Theese allow her to change her physical appearance. She usaully turns into a guy form to sneak onto ships and steal from rich ladys. mk, the ship you're wanting is The Scarlet if you want to be captain. Also, you need to tell me what your item is and what it does. Otherwise, looks good. Did you read through everything at the top? The items are listed there. looks good. Also, you don't have to include the picture of the guy she transforms into. The ruby earings can transform you into anyone. Plus, someone might want to use that picture ^^' I'm not sayin' you can't, but just throwin' that out there. so when will the rp be open? I think if I get two more characters in, i'll bring up the role play. I'm going to e-mail a friend and ask her if she'll join. So you're waiting for more captains and other pirates? Rita: Do I get paid for this? Ya, pretty much. There are a lot of positions to fill, so I might allow people to make two characters. But Iw ant more people to sign up first. I AM NOW ALLOWING TWI CHARACTERS. + Pros: With a "no nonsense" attitude, Isidore is very loyal to her crew alone. She's very level-headed and always able to think straight, even in the worst of situations, which makes her quite reliable as First Mate. She will do whatever she can to protect her crew, even if that means putting her own life in danger. She's a skilled fighter, keeping a trusty scimitar on her person at all times. Also worth mention, she's very skilled at theft - she's able to get what she wants through various means of robbery, and has seldom been caught. Determined, straight forward, and dedicated - these are her most notable characteristics. - Cons: She's very suspicious of everyone who isn't part of her crew, often times making the accusation that innocent people are dangerous, which in itself is quite dangerous. She's also very cocky, believing that her crew mates are all by far superior to everyone else - this, of course, ties into her desire to pick petty arguments, which more often than not escalate to something big. She really needs to learn to keep her mouth shut. Another flaw is that she's terrible at remembering names. Even those in her own crew, she may be likely to forget their names often, even if she sees them every day. History: Isidore has been a member of The Atlantic's crew for as long as she can remember - she has no memories of her family, nor does she remember ever living or growing up in Reta. However, Reta was the place that she always felt less eager to pillage and it's the only place she actually doesn't feel so uptight, so she's pretty much taken to calling it home. She doesn't remember much about Johnson or Mai's kidnapping as she suffers from eclectic memory loss, but she's become quite dedicated to Mai as the captain. Izzy believes that if Johnson left the role of captain to her, then she must surely be worthy of the position. It's based on instinct that she's willing to throw her life away for Mai, if need be, and she doesn't really find anything strange about this. As a side note, though it's never remembered by Izzy, she did grow up in Reta, but her parents were killed by pirates. She pretty much grew up raising herself in the streets, taking to stealing to get by, which is why she's so good at it in the current time. This is also why she grew so cautious of people as she grew up learning not to trust anyone. You might want to fix the picture up a bit though, just becuase of the amount of skin that's showing. All you really have to do is photoshop her pants higher. If you don't know how, you could ask someone who does like Kitty or me. Or anyone else who knows how that's willing to. Also, I've decided to create a list of NPC's that are allowed. Only certain people will be able to control these NPCs. I might add more to this list later. If you have any suggestions, lemme know. Also, if there is a certain NPC you would like to have, PM me about it. I am also going to create a list of characters that play vital roles in this role play. They could be NPC's or RPC's. More people may be added to the list as more people join.